Boil the patatoes with salt and smash in to medium chunks. Heat the oil in the pan and add mustard and cumin seeds. After it splutters, add cashew nuts,greenchilli,curryleaves and ginger. Now add onion and fry till transulent and add turmeric powder. Its time to add boiled smashed potatoes with salt and mix well. Add little water if required to bring the consistency. Let the mixture be cool and make in to small round dumplings. Take the bowl with gramflour,baking powder,chillipowder and salt. Now dip the aloo dumpling in the batter and fry in the hot oil. Let it fry all around till it becomes reddish brown. 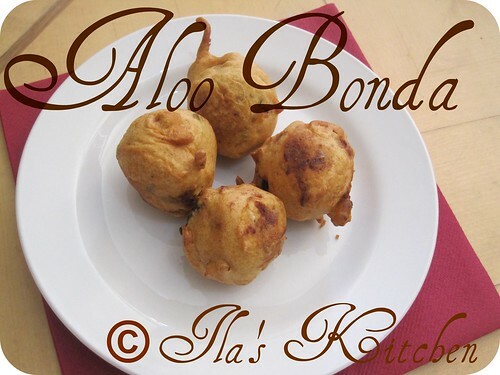 Now, Aloo Bonda is ready to serve. This yummy Aloo Bonda can be served with Coconut and Tomato Chutney as starters. I am sending this recipe to Sravs Cooking Concept - Appietizers Event. Ooh! This is a perfect tea time snack and also ideal for us to have during Iftar. u can send to my ongoing event !! An ideal tea time snack, love to have it with coconut chutney,nice click. My fav tea time snack...Looking at these clicks im so craving for garma garam bondas!!! Aloo bonda looks dleicious. Love to have them with my tea. 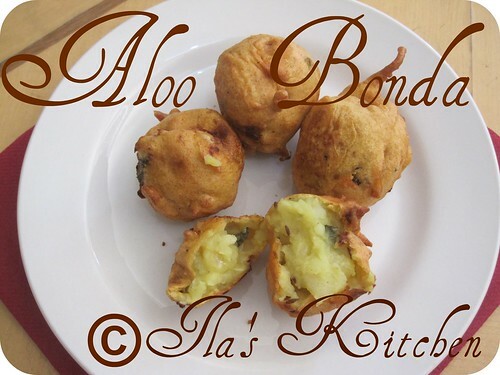 aloo bonda looks delicious and tempting...yumm!! !